14K bezel, natural nuggets, and a nephrite jade cab marker. Did I mention I hate soldering nuggets??? All precision cut in wax on our CNC mill, and cast. Not a fan of gold nugget style in general, however that was designed and made as well as I have ever seen it. At least they aren't having me make those fake nugget look stuff! Last piece for now - someone brought in a worn out gem in a worn out ring, a couple of generations old, and wanted it re-made for a grand daughter. 14K, a zillion diamonds in the halo. 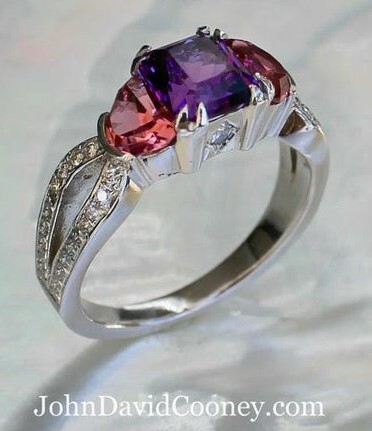 I think the total project was over $3,200, but then the amethyst was over 1" long! File comment: Front view, with the old ring. File comment: Side view - scrolls! Late ,slightly, Christmas present for my wife. Center stone is a Zambian Amethyst, 7.8X7.6mm Modified Squarish Brilliant Mixed. Stone weighs 2 carats. Side stones are Maine Pink Tourmalines done in a freeform step Half Moonish. Stones weigh 1.27 carats total. Ring is done in 14K Palladium White and was executed by my friend, as well as photographed, by John Cooney. Wife forgave me for my transgression! Very nice, Paul - my wife would love something like that too!!! Congratulate John on a job well done, both goldsmithing skills and photography!